Stock up on ammo and rework your loadouts, Commanders! This spring you can earn a new vehicle! Prepare for new levels of excitement when you're on the hunt, because this challenge’s Grand Prize is the first-ever American Tier VIII Premium tank destroyer in World of Tanks, the TS-5! A natural-born damage dealer with decent armor, this steel beast is a worthy reward for those who prefer fighting at the frontline to sniping or active flanking. In World of Tanks, there are many different tank destroyers, but there isn't a single American Tier VIII Premium TD. Considering the United States was one of the first nations in the game, it's time to remedy the situation! If you already play American TDs, you'll feel right at home with the TS-5 because it combines some of their best qualities. A low profile and good concealment with high DPM mean you can hit hard and they'll never see it coming! NOTE: The TS-5 is best played at the front, using its incredibly tough hull to bounce enemy shells. So get a shot off, and then pop back into cover so that enemies have a hard time hitting you. The TS-5’s survivability to a large extent depends on one’s skill with using vehicle armor and selecting an appropriate opponent. 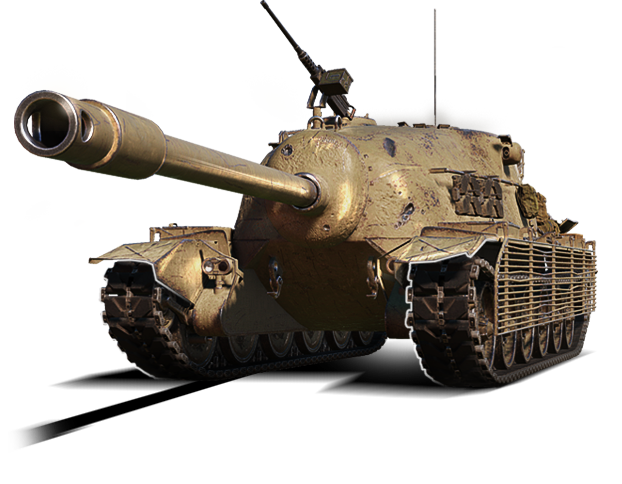 Keep in mind that the TD’s impressive armor will help against Tier VIII adversaries, and may save the vehicle when facing Tier IX opponents, however confrontations against Tier X’s should take place on your terms. Choose a combat direction wisely, considering what your allies do. The vehicle’s low mobility makes one choose a combat direction carefully. The TS-5 can fortify the allied defense positions or become a reliable aid to force through the enemy defense lines, but only when the right decision is made at the beginning of a battle. Choose carefully with whom and where you will go once a battle begins. Finally, you can move Crews from other top-tier American tank destroyers into the TS-5 without penalty, as it has five Crew members. Your chase for the Grand Prize lasts 10 days, from April 5–15. The American Challenge features 10 consecutive stages to complete, fulfilling tasks for Mastery or for Commitment. Missions for Commitment: The best option for players with a strong desire to get their hands on the outstanding TS-5. Task conditions will be diverse, but they must be performed using Tier VI–X vehicles. Just remember: Your result will only count if you finish in the top 10 of your team’s roster at the end of battle — no matter whether your team wins or loses. Missions for Mastery: You can opt for alternative, but more complex tasks. Fulfilling these objectives will save you time, but you’ll have to give your all to succeed. You can only complete these tasks using Tier IX–X machines. NOTE: Both sets of tasks can be fulfilled simultaneously (given all conditions are met), so it doesn’t matter how exactly you end up progressing to the next stage. The mission that is completed first will go in your victory column. However, compared to the most recent challenge for the Panhard EBR 75 (FL 10), missions for Commitment will be modified. Thanks to your feedback and suggestions, we have slightly adjusted the conditions of some tasks that you were struggling with during the Challenge on Wheels. We are also continuing to look for the optimal balance between mission complexity and their feasibility based on our statistics. This time we removed tasks in which you need to achieve a certain number of victories. Instead, we added a new type of task where you need to deal a certain amount of damage. In addition, we slightly changed the distribution of some rewards for completing specific missions. But as before, finishing each stage will fill your vault with Credits, Personal Reserves, and Consumables. Check it out! Earn at least 250 base XP four (4) times in a Tier VI-X vehicle. Earn at least 750 base XP once (1) in a Tier IX-X vehicle. Earn a total of 4,500 base XP. Only XP earned for being one of the top 10 XP earners on your team in Tier VI-X vehicles is counted. Be among the top three (3) XP earners on your team two (2) times and earn at least 550 base XP in each battle. You must be in a Tier IX-X vehicle. Be among the top 10 damage dealers on your team 12 times. You must be in a Tier VI-X vehicle. Cause at least 3,000 HP of damage three (3) times and be among the top five (5) players on your team by damage caused in each battle. Earn a total of 12,000 base XP. Only XP earned for being among the top 10 XP earners on your team in Tier VI-X vehicles is counted. Earn at least 800 base XP six (6) times. Cause at least 500 HP damage in a battle 25 times. Cause at least 15% of the total amount of damage for your team seven (7) times. Earn a total of 20,000 base XP. Destroy at least two (2) enemy vehicles nine (9) times and cause at least 3,000 HP damage in each battle. Earn at least 500 base XP 25 times. Earn at least 850 base XP 12 times and be among the top three (3) XP earners on your team in each battle. Cause at least 500 HP damage 40 times. Be the top XP earner on your team and cause at least 2,000 HP damage in the same battle 12 times. Earn a total of 30,000 base XP. Be the top damage dealer on your team and destroy at least two (2) enemy vehicles in the same battle 12 times. Be one of the top 10 XP earners on your team 50 times. Be the top XP earner (at least 850 base XP) on your team 12 times. If you’re willing to try out the new experience immediately, you can head straight for the Premium Shop and purchase the whole bundle featuring all the rewards for each event battle mission and the TS-5. Completing stages beforehand will give you discounts on the final price — 10% off for each stage completed — if you decide to purchase the bundle. For example, completing 5 out of 10 stages will knock 50% off the price. Purchasing the bundle gives you the full collection of rewards and automatically checks all event battle missions as completed, so you won’t be able to access them once you have the bundle. Take on the American Challenge and grab your well-deserved rewards!